Household aluminum foil refers to the aluminum foil used by the family to make and store foods. It has the advantages of convenient use and safe. It is also widely used in hotels and restaurants. Household aluminium foil is the aluminum foil product we can see in the daily life, people can buy it in the supermarket and stores nearby. The common specifications for aluminum household foil are as follows. 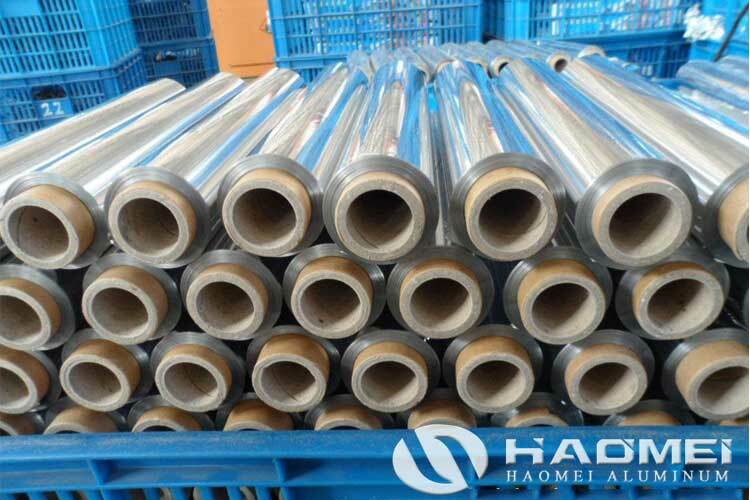 The thickness is 0.012-0.03mm, the width is 300-500mm, the length is 8-50m/roll, wound on a paper core with a certain strength, the alloy is mainly 8011 aluminum alloy with annealed state. With the advantages of light weight and safe, household aluminum foil helps people a lot on backing or warping food. Due to the household aluminium foil is the most widely used aluminum foil product in home, the quality requirement must be more strict than ordinary foil product. The main quality requirements of household aluminum foil are as follows. The surface should be clean and smooth, the cracks, wrinkles, bumps, corrosion, traces and residual oil are not allowed on the surface. The core, packing material and adhesive used must be non-toxic and odorless. The tensile strength of aluminum household foil is greater than 5 MPa, and the elongation is greater than 2%. If you have search for household aluminium foil in large quantity, we would like to recommend ourselves as your supplier, with more than 25 years experience in 40 countries, you request will be tread seriously, we will supply both best product and service for you!